1. First you make a pony tail placed as low as possible. This is to make space for your helmet. Finish with hairspray. 2. Take the donut and place it like in the picture. 3. Bend your head/back foreward and comb the hair nicely over the donut. You can allready spray some hairspay here, to keep the hairs perfect. *If your are doing your hair yourself, then spred the hair over the donut with your fingers. *The more you bend forward the easier it is, especially if you have no help. The more horizontal the donut is, the easier is it do spred the hair on it. 4. Carefully, with out messing up the hair, place a hairtid around the donut. If there is a small bump in the hair, you can carefull use the comb to fix it. You can also add an extra hairtie to add even more hold on the donut. 5. When the hairtie is placed, spray a good layer of hairspray. This helps keeping the hair perfect. 6. Separete the hair in 2. 7. Roll one part one way around the donut and roll the other part the opposite way. 8. When you do that you get all the hair in place and it will be more evenly placed around the donut. Place a hairtie again to keep the hair in place before adding the hairnet. 9a. Place a hairpin in each end of the fine hairnet. 9b. Place a silikone hairtie in each end of the fine hairnet. 10. Place the hairpin/hairtie and spin the hairnet around the donut to get all loose hairs inside the hairnet. 11. Here you can see how to stretch the hairnet and cover all the hair ends. 12. Here you can see how to stretch the hairnet and cover all the hair ends. 13. Finish by fasten the hairpin/hairtie in/around the donut. 14. 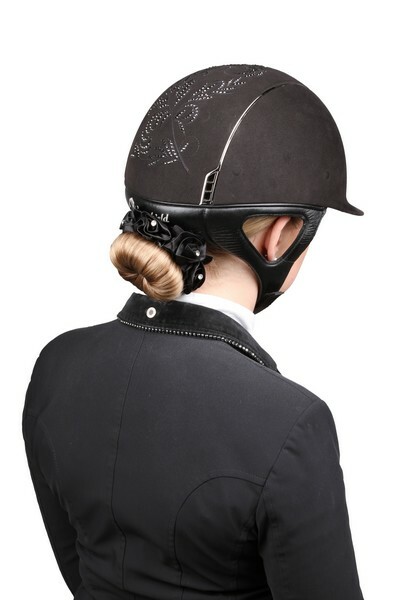 Add a good layer of hairspray to keep the hair perfect while riding. 15. When you get the helmet on, you can pull in the donut so there is enough space for it below the helmet. 16. As you see here, you can give it a good pull! 17. Now it is perfectly placed. 18. 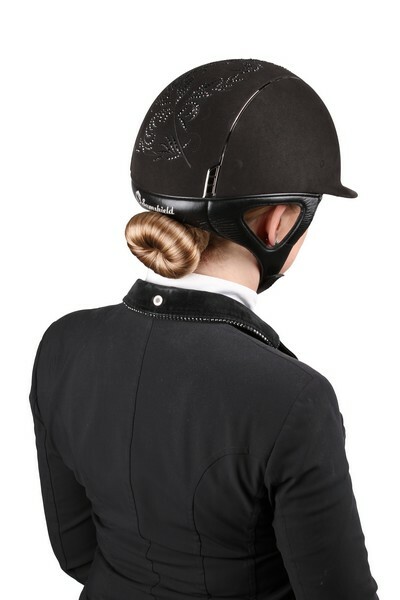 Add your favorite SD scrunchie/hairnet and you are ready for your show!